The ‘Leamington Spa Courier’ newspaper dated 20 December 1918 described Henry Tandey as ‘a hero of the old berserk type’. Never were truer words written about a Leamington man who was the most decorated British private soldier to return from the battlefields of the First World War. 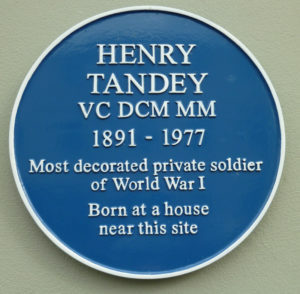 Henry Tandey was born on 30 August 1891 in Swain’s Buildings at the bottom of Kenilworth Street, a property which has long since been demolished. Henry’s birth was registered by his mother Catherine who gave her address as 2 Albion Row. His father James was recorded as a journeyman stonemason. 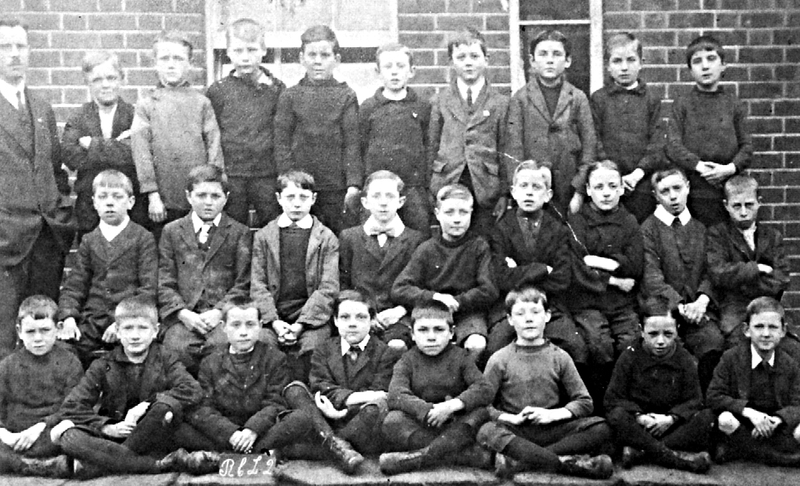 Henry had a difficult childhood and although he attended St Peter’s School, he admitted to having spent part of his childhood in an orphanage. At the age of 18, he got a job at the Regent Hotel on the Parade where he was employed stoking the hotel’s boilers. Like many lads of his age, Henry was no doubt looking for a more exciting life and he decided to ‘take the King’s shilling’ and enlist in the British Army. He joined the Alexandra, Princess of Wales’s Own Regiment (Green Howards) in Richmond, Yorkshire in August 1910 and was posted to the 2nd Battalion with the service number 9545. He was quite a short man at five feet six inches tall and was known throughout his adult life by the nickname ‘Napper’. He served with the Regiment in Guernsey and in South Africa and was with them on the Western Front from the early days of the First World War. In October 1914, he rescued a wounded colleague, carrying him back through the British lines to the First Aid Post at the Menin Road Crossroads near Ypres. 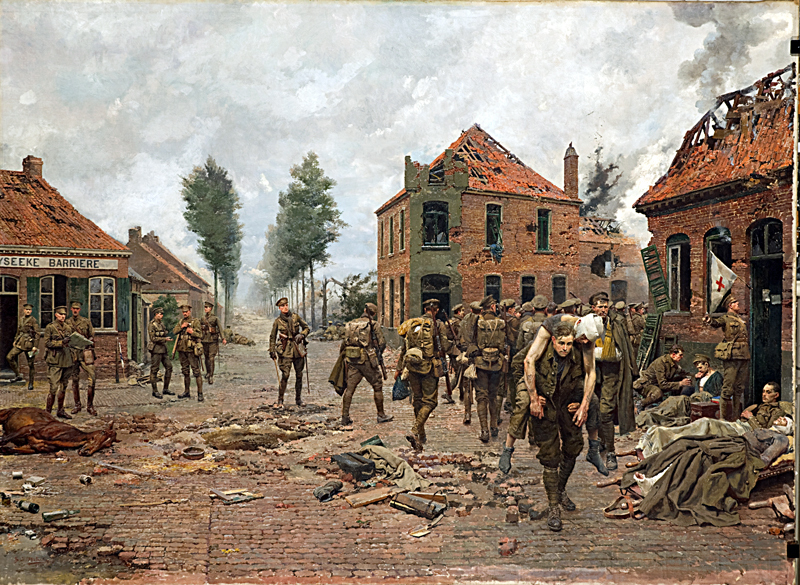 One of the most talented war artists of the period, an Italian named Fortunino Matania made a painting of the incident which now hangs in the Green Howard’s Regimental Museum. Henry took part in the first Battle of Ypres in October 1914 and was shot in the arm at the Battle of the Somme in 1916. 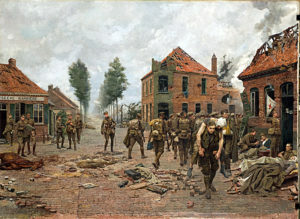 He was again wounded during the Battle of Passchendale in November 1917 whilst serving with the 5th Battalion the Duke of Wellington’s Regiment. 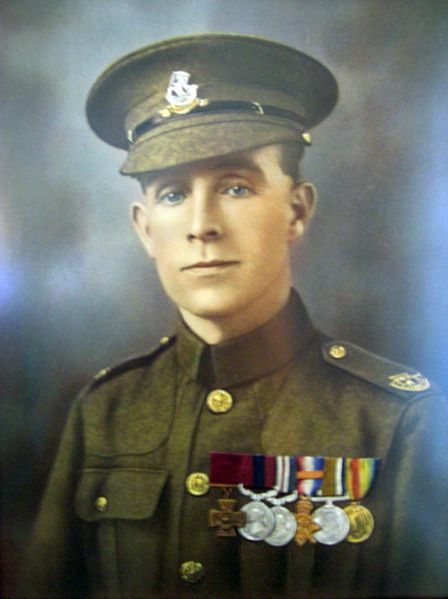 The war on the Western Front swung increasingly in favour of the Allies in late Summer 1918 and in an almost unparallelled burst of heroics by a single soldier, Henry Tandey won the three highest awards for bravery in the space of six weeks. 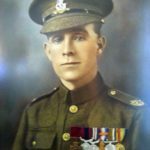 He was awarded a Distinguished Conduct Medal, then a Military Medal and bar and finally a Victoria Cross for ‘desperate bravery and great initiative’ in one of the final battles of the war. He was also mentioned in despatches five times and on one occasion was told by a senior officer that his bravery could not adequately be rewarded because he had already won all the gallantry medals available. He was presented with his Victoria Cross by King George V at an investiture in Buckingham Palace in the week before Christmas 1918. After the war, Henry Tandey was employed for a period by the Army on recruiting duties. In 1919 he was made a Freeman of the Borough of Royal Leamington Spa and was presented with an illuminated scroll and an engraved silver-gilt casket. On Armistice Day 1920 he took part in the service for the burial of the Unknown Warrior in Westminster Abbey where he was one of a hundred holders of the VC who were selected to line the nave of the Abbey as the guard of honour. Twenty years after the end of the Great War, a story began to circulate of how in the earlier conflict Henry had spared the life of a certain German infantryman who came into his gun sights one day. According to the story, the man whose life Henry had reportedly spared was a German regimental despatch runner by the name of Adolf Hitler. The tale has been recounted any number of times over the years in newspaper and magazine articles and has been further embroidered in the process. The military historian David Johnson has researched the incident in great depth for his book ‘One Soldier & Hitler 1918′ and has concluded that no part of it could be proved to have taken place. Henry gave up soldiering and returned to civilian life in 1926. He got married for the second time to Edith Warwick and the couple moved from Leamington Spa and settled at Cope Street in Coventry. Henry got a new job working for the Standard Motor Company as a commissionaire, a job he would hold for the for next thirty-eight years. 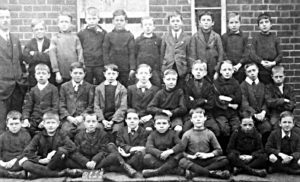 During the Second World War Henry was a Coventry Air Raid Warden and on the night of the German bombing on 14 November 1940 he returned home to Cope Street in the early hours to find that his house had been destroyed. Fortunately his wife Edith was staying with her sister in Leamington on that particular night. 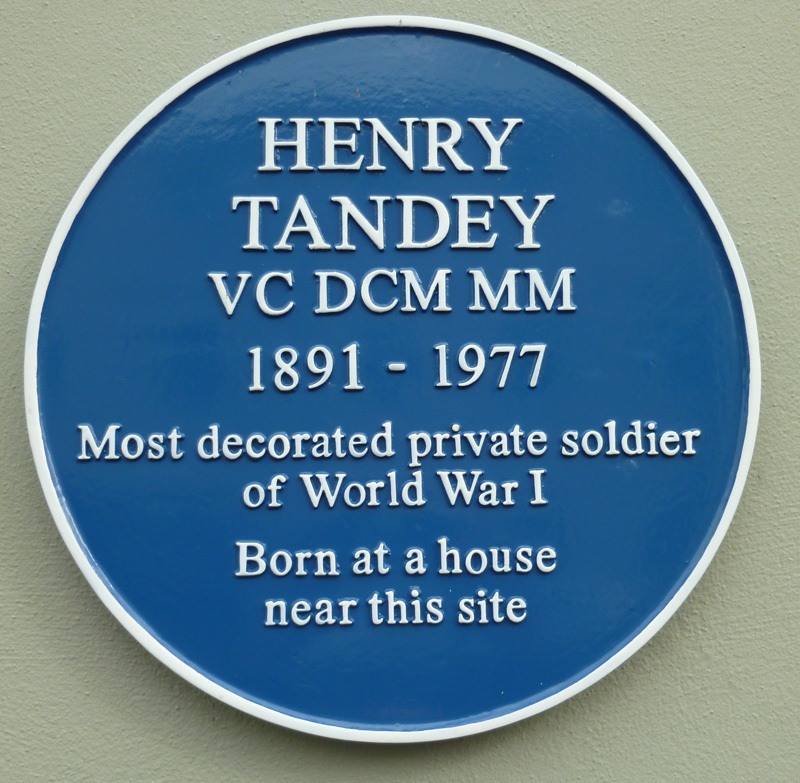 Henry Tandey died at home in Coventry on 20 December 1977 at the age of eighty-six after suffering from cancer. His final wish was that his ashes should be scattered at Marcoing British Cemetery, near to where he had won his Victoria Cross and where many of his wartime colleagues were buried but for a variety of reasons this was not possible. The casket containing his ashes was buried without ceremony in the British Cemetery at Masnières in October 1978. In September 2012 the Leamington Town Council erected a Blue Plaque to commemorate him on a building in Kenilworth Street close to where his birthplace had once stood. It was unveiled ninety-four years to the day since he had won his Victoria Cross and become ‘a hero of the old berserk type’. 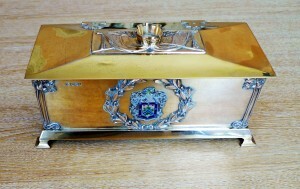 His Freedom Scroll and casket are in a display cabinet in the Mayor’s Parlour at Leamington Town Hall. Leamington Borough Council planted a maple tree in memory of Henry in the Jephson Gardens but the plaque marking this has now disappeared. A Blue Plaque is displayed on a building near the bottom of Kenilworth Street.